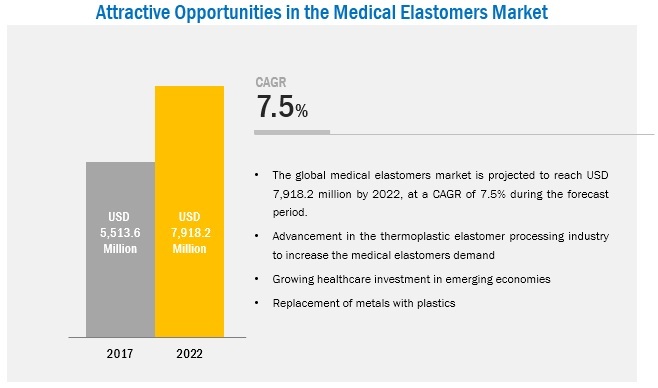 [124 Pages Report] Medical Elastomers Market was valued at USD 5.11 Billion in 2016 and is projected to reach USD 7.92 Billion by 2022, at a CAGR of 7.5% during the forecast period. The base year considered for the study of the medical elastomers market is 2016 and the forecast period considered is between 2017 and 2022. The research study involved the extensive use of secondary sources, directories, and databases, such as Hoovers, Bloomberg, Factiva, the Securities and Exchange Commission, the American Medical Association, and the World Health Organization, to identify and collect information useful for this technical, market-oriented, and commercial study of the medical elastomers market. 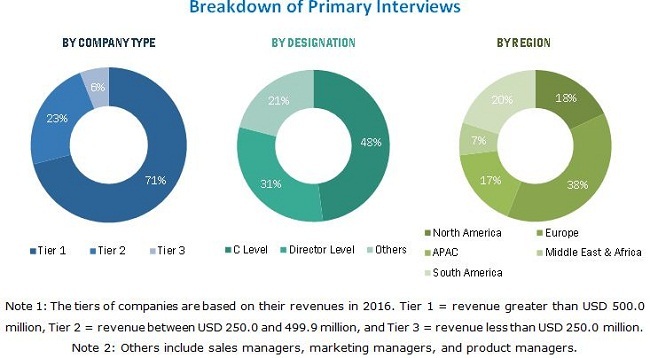 Both, top-down and bottom-up approaches have been used to estimate and validate the size of the medical elastomers market and estimate the sizes of various other dependent submarkets. Some of the key players operating in the medical elastomers market include BASF SE (Germany), DowDuPont (US), Eastman Chemical Company (US), Royal DSM (Netherlands), and Solvay S.A. (Belgium). This study answers several questions for various leading players across the value chain of medical elastomers, primarily which market segments to focus on, in the next two to five years for prioritizing their efforts and investments. This research report categorizes the medical elastomers market based on type, application, and region. 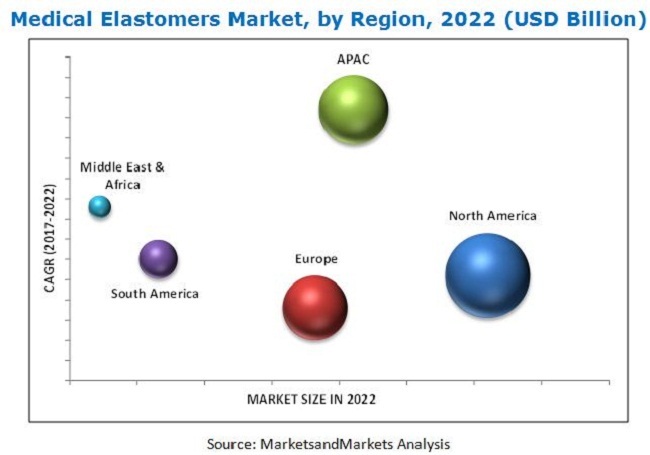 The medical elastomers market has been further analyzed based on the key countries of each of these regions. The medical elastomers market is projected to grow from USD 5.51 Billion in 2017 to USD 7.92 Billion by 2022, at a CAGR of 7.5% during the forecast period from 2017 to 2022. The growth of the market is attributed to the rising demand for medical devices across the globe. Increased awareness among governments to provide high-quality healthcare infrastructure is expected to drive the demand for medical devices, which will, in turn, lead to the growth of the medical elastomers market across the globe. Also, technological advancement in the thermoplastic elastomer processing industry has made these elastomers an ideal choice for medical device manufacturing, leading to an increase in demand for thermoplastic medical elastomers in medical devices. Based on type, the medical elastomers market has been segmented into thermoplastic and thermoset elastomers. The thermoplastic elastomers segment accounted for a larger share of the medical elastomers market in 2017. This segment is also projected to grow at a higher CAGR than the thermoset segment during the forecast period. The growth of thermoplastic elastomers is attributed to their increased demand in the manufacturing of medical tubes, catheters, medical bags, and other devices. Based on application, the medical elastomers market has been segmented into medical tubes, catheters, syringes, gloves, medical bags, implants, and others. The medical tubes segment accounted for the largest market share in 2017. The increasing use of medical tubes in the diagnosis and treatment of diseases is further expected to drive the market for medical elastomers. The implants application segment is projected to grow at the highest CAGR during the forecast period owing to the increasing demand for orthopedic and prosthetic implants. The medical elastomers market has been studied for APAC, North America, Europe, South America, and the Middle East & Africa. The APAC region is expected to lead the medical elastomers market during the forecast period. The growth of the APAC medical elastomers market is attributed to the region’s growing population and increasing healthcare expenditure of various countries, such as India, Indonesia, and China. Additionally, increased investments from private and government sectors to improve the healthcare infrastructure across countries are also expected to create a demand for medical devices, thereby fueling the growth of the medical elastomers market in the region. The medical elastomers market is witnessing significant growth in China, India, Indonesia, and Saudi Arabia, owing to the increased consumption of medical devices in these countries. 10.9 Momentive Performance Materials Inc.